Make the transition from breast to bottle as easy as possible for Mother & baby with the NUK First Choice Learner Bottles. Making the transition from bottle feeding to drinking from a cup can be a big step but help is at hand with the NUK First Choice 150ml Learner Cup. Designed to make the transition easier for your baby, NUK's First Choice Learner Cup features anti-slip grip trainer handles which make it easy for your child to hold the cup themselves. The Learner Cup is fitted with a silicone spout with a non spill design which helps reduce mess, making it ideal for active babies. The spout also features the NUK Anti-Colic Air System which minimises infant colic caused by harmful swallowing of air. 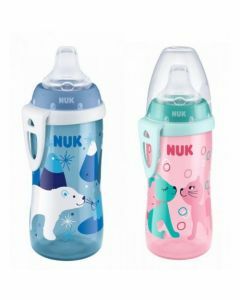 NUK First Choice bottles are compatible with all First Choice+ Teats. For safety and hygiene purposes we recommend that you replace spouts after 1-2 months of use or whenever they start to show signs of wear.